Home /Knowledge Base /Must Read /How to I print letters without credit repair cloud showing on the letter? Home /Knowledge Base /Common Browser Issues /How to I print letters without credit repair cloud showing on the letter? Home /Knowledge Base /FAQ /How to I print letters without credit repair cloud showing on the letter? How to I print letters without credit repair cloud showing on the letter? 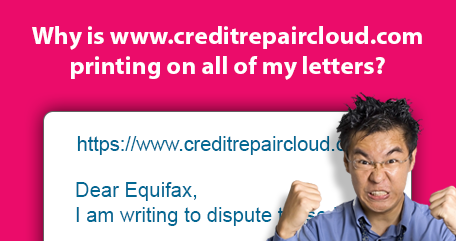 The issue of our URL is printing on the top of your dispute letters is not caused by Credit Repair Cloud. This problem is caused by your own settings in your web browser. This link will help you to change the setting in Internet Explorer and FireFox so it will never happen again: http://www.howtogeek.com/howto/the-geek-blog/prevent-firefox-or-internet-explorer-from-printing-the-url-on-every-page. Is that link not helping? Here’s another link that might be better for you: http://www.mintprintables.com/print-tips/header-footer-windows/ It takes about 30 seconds to change the setting — and your letters will always print correctly after that.